Image by Neil Webb/Ikon Images. With the unemployment rate for young people still nearly double the national rate, young adults are not the only ones who bear the burden of the economic recession. A new Pew Research Center survey shows that middle-aged parents are increasingly providing more financial support to their grown children. The Pew report focuses on the so-called “Sandwich Generation,” middle-aged Americans who find themselves financially “sandwiched” with increased pressures to provide support for both aging parents over 65 and their children, including those who are already grown up. The report concludes that the financial burdens have mounted for these middle-aged individuals primarily because more of them are now supporting grown children. In fact, middle-aged adults are more likely to give financial support to their grown children than to their aging parents. In the last year, more than one in seven parents ages 40-59 have provided some or primary financial support to a grown child over the age of 18. And of the parents providing primary support, more than one-third are doing so while their grown child is not enrolled in school. So why is it that grown children have become a greater financial load for middle-aged adults than their aging parents? It all comes down to economics, according to Kim Parker, the primary author of the Pew report, who says young adults have a greater need for support. The unemployment rates would support this picture. While the worst of the recession may be behind us, the U.S. economy is growing at a sluggish pace. Unemployment rates for young adults have decreased slightly but young adults continue to struggle financially more than the rest of the population. The Bureau of Labor Statistics average unemployment rate for December 2012 was 7.8 percent, the lowest it has been in four years. 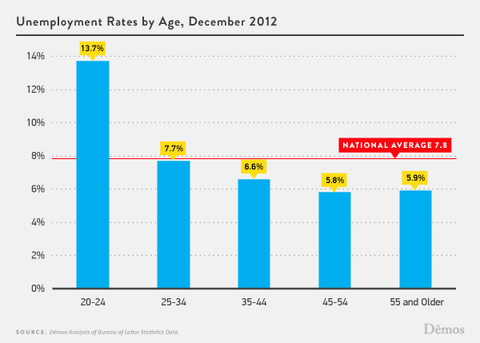 However, broken down by age group, unemployment for young adults 20-24 was almost double the national average. Demos policy analyst and economist Catherine Ruetschlin, who publishes a monthly analysis on Millennial employment data, says that the economic hardship on young people is greater than the unemployment rate can measure. “There remain millions of young workers who cannot find the employment they need,” especially in order to be financially independent from their parents, Reutschlin says. By her estimation and analysis, using Bureau of Labor Statistics (BLS) data, she calculates that in December 2012, nearly a fifth of all young adults (18.7 percent) between the ages 25-34 were unemployed, underemployed or had dropped out of the workforce. In a Pew report released in May 2012, “The Boomerang Generation” Pew found that 29 percent of young adults ages 25-34 were either living with their parents or had moved back in temporarily in recent years because of tough economic conditions. These young people are likely to be many of those grown children whose parents are providing some or primary financial support. And their employment status, whether underemployed or unemployed, is also likely to be connected to their parents’ decision to provide financial support. Jobs numbers for January will be released Friday, refreshing our current understanding of the economic picture for 2013. If middle-aged Americans needed an extra push to take the problem of youth unemployment as a significant economic concern, this survey from Pew could offer some impetus. Boomer Babies ‘Boomerang’: Happy Homecoming? Or Are Grads Giving Up? Be sure to check the Making Sense page Friday for economics correspondent Paul Solman’s analysis of the jobs numbers for January 2013, including his own special scale to measure unemployment. Graphs provided courtesy of the Pew Research Center. Read the full survey and report, “The Sandwich Generation: Rising Financial Burdens for Middle-Aged Americans” on the Pew website.